If the state (and the state system in aggregate) is still a thriving institution, historical forces will conspire to drive the creation of states. States will spontaneously re-emerge if disrupted. Further, actions taken (read: invasions and regime change) against states will result in temporary chaos followed by easy and rapid stability. If the state system is in decline (ala Martin van Creveld), states will find it increasingly difficult to maintain financial viability, deliver critical services to citizens, control their borders and economy, and maintain a monopoly on violence. States that are disrupted will find it difficult, if not impossible, to re-establish order and functionality. Historical forces will conspire to defeat any attempt at reforming the order of the state. The evidence seems to point to the latter argument. States are increasingly finding themselves in perpetual disruption or complete failure. One driver of this is globalization. Globalization has diminished state power across the board ("it melts the map"). So, if we want to build a peaceful (and profitable) system that obeys a new rule set (to borrow a phrase from Thomas Barnett), the limits of state power must be a critical factor in its development. This new revised view might be appropriately called the Humpty Dumpty principle of state failure. The rapid innovation of the Iraqi open source insurgency is yielding improvements in guerrilla technology. In the words of one British Army bomb disposal officer, "These guys have picked up in two years what it took the IRA a quarter-century to learn." The most recent innovation (after the arrival of shaped charges) gaining popularity are infrared triggers for IEDs (improvised explosive devices). These triggers are a conversion of the simple "light" beams used in burglar alarms (see image) and as safety mechanisms on garage doors. 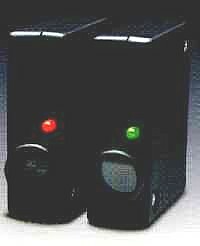 The beams are activated remotely by radio controls when a patrol approaches. When the light beam is crossed the bomb goes off. Unfortunately, unlike radio controls the beams are not easily jammed. These new triggers have been used in numerous deadly attacks on British forces over the last several months. This innovation may be due to Iranian involvement, but a more probable explanation is that the insurgency itself is finding low-tech solutions to difficult problems through an open source development process. Regardless, this innovation will rapidly proliferate throughout Iraq. Our problem is that the cycles of innovation that yield deployable counter-measures for US and British forces are slow and non-responsive by comparison. This is another aspect of global guerrilla math: our deployed innovation is measured in years and theirs in months. -OR- that a $1.2 billion program for IED counter-measures could be trumped by a $10 burglar alarm sensor. NOTE: One potential solution is to use private military forces (PMCs) to provide IED detection and clearing services to US military units on patrol. Small PMCs would be able to circumvent the military acquisitions system to source, test, and deploy the best equipment faster. The bulk of Saudi Arabia's security system is allocated to the defense of oil system assets. Despite this effort, the system remains extremely vulnerable. The reason for this vulnerability is due to the effectiveness of new methods of warfare being developed in Iraq. A dictum from the newly emerging global guerrilla doctrine is: Avoid direct attacks on highly defended assets. Attack the target indirectly through adjacent systems. Today's disruption (one of several of this type over the last year) of Iraq's oil terminal in Basra demonstrates how this is done. Sabotage of a main transmission line north of Baghdad shut down Iraq's electrical system in parts of central and southern Iraq on Monday. This outage shut down the oil export terminal for most of the day. This attack likely cost the Iraqi government in excess of $100 m in export earnings alone for a total attack cost of less than $1,000 (see Global Guerrilla math for more). The electricity cell was the first to take action with an attack on one of the two high voltage power lines from the Ghazlan power complex. Since Ghazlan provides over 40% of the power in the eastern province and the electrical network is sparse (and except for a single connection to the central region, isolated), this attack caused over voltages that resulted in a system wide blackout that lasted two days. Oil production from the province was cut in half as systems (refineries, pumping stations, port facilities, etc.) 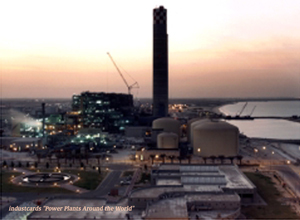 that supported the huge Ghawar oil field were unable to acquire the power necessary for full production. Saudi Arabia has an isolated and extremely vulnerable electrical system. For a global guerrilla, Ghazlan's substations represent the prime systempunkt. Additional systempunkts are available in the field water injection system. Attacks on these systems are 1) relatively easy, 2) will have major impact on the primary target through cross infrastructure cascades of failure, and 3) are difficult to defend without exposing primary systems to attack. Haditha, a town of 90,000 people only a three hour drive north-west of Baghdad, has developed into a full blown temporary autonomous zone (TAZ) like Fallujah. As a TAZ it is totally independent of the central government's control and constitutional process. Its management (under Islamic law) is in the hands of Emirs from the guerrilla groups Ansar-al-Sunna and Tawhid al-Jihad (al Qaeda in Iraq). These groups drove out the Shia-dominated police force sent to impose control over the town last year. 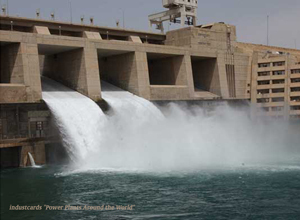 Omer Mahdi of the Guardian reports that the guerrillas have been able to use mafia-style pressure on the local power plant (at the Haditha Dam pictured above) to ensure that the town gets 24-hours a day of electricity. This is in contrast to the 8-9 hours a day of electricity the rest of the country gets. The ability to deliver basic services, when the central government cannot, generates legitimacy. Nearly 460 small bombs exploded across Bangladesh today almost simultaneously (within 30 minutes of each other). The targets included government offices and courts. The small size of the bombs, their placement (open areas), and the lack of shrapnel (nails, etc.) limited casualties, apparently by design. The country is now in now in full alert. Indications are that this is an attack by the Jamiat-ul-Mujahideen. Since these attacks didn't target infrastructure, they did not gain the leverage necessary for a nation-wide shut down. The essence of guerrilla war, according to the late great military theorist John Boyd, is moral conflict. The side that can destroy the moral bonds (those that permit the organic whole to exist) of the other side first, wins. One problem we face is that the moral bonds of our enemies are seemingly opaque. One potential explanation for this opacity is that the moral bonds of our opposition are often tribal (both traditional tribes and "manufactured" tribes like gangs and al Qaeda). To explore this, let's start with a insightful paper by David Ronfeldt (of RAND) that provides a very useful exploration of tribal organizations (David told me he is writing a book on this subject). Egalitarian. Every member of the tribe is roughly equal to all others. Order is maintained through mutual respect, ritual, and honor. Segmental. Each major section of the tribe is like any other. It can also operate autonomously if needed. Everything the tribe is can be cloned from a segment of the tribe. and Acephalous. There isn't a hierarchy. Elders or "big men" are seen more as advisors, brokers, facilitators, and role models than leaders. Roles shift depending on need. Tribes fight wars over honor, respect, and encroachment. Once engaged, they do not fight as a cohesive group but rather in segments. Each tribal segment acts autonomously to attack its target (usually with ambushes and raids). Religion plays a strong role in that it can be used to justify and reinforce the tribe's actions. In Iraq, we don't face a single tribe (either traditional or manufactured). We face dozens. Wholesale systems disruption and violence has forced great many people (particularly young men) into tribal organizations for economic support and defense -- a pattern we see repeated in other failed states. In Afghanistan, we see tribes in control of most of the country as well as a multi-billion dollar opium industry. Globally we see rapidly growing manufactured tribes like the Mara Salvatrucha (already over 700,000 strong) and al Qaeda in open war with states. The appeal of these tribes -- the sense of belonging they represent -- transcends borders. It is able to motivate young men in the UK and Honduras to undertake acts of extreme violence in the hope of gaining membership. Until we understand the moral bonds of networked tribalism, there is little hope that we will morally defeat it. 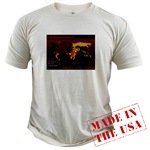 As an unwilling participant in the new epochal war, you qualify for a great new t-shirt from a talented reader of this site, Greg Burton: "Globalization Melts the Map" (inspired by ever observant author Bruce Sterling who asked for one). Needless to say, I am not making any money on this (neither is Greg). I think it is a cool adaptation of the site's theme to a T-shirt. To find the latest in system disruption and open source warfare, let's jet to the rural state of Assam in the northeast corner of India. Assam is a net oil exporter. It produces over 50% of India's domestically produced oil (it was also one of the first places in the world where oil was found). Despite this oil wealth, Assam's 26 million citizens have fared poorly economically and unemployment runs high. Ongoing neglect by the central government has spurred a widespread movement for independence. However, like Iraq, a diverse set of over two dozen guerrilla groups (ULFA, NDFB, BLT, UPDS, DHD, KLO, HPCD, etc.) have formed along the state's numerous social fault lines. This is a horrible story to start the day with: Fourteen marines were killed early today when their troop carrier struck a gigantic roadside bomb in the western town of Haditha, marking one of the single deadliest attacks on American troops since the invasion here in March 2003.